The Exhibition News Race Day and accompanying Question Time debate returns to Sandown Park Racecourse for the fourth straight year. This year, EN and invited guests will tackle the critical debate on whether UK trade shows are cheapening their product by giving away so much free content to attendees. The debate on 17 September will challenge whether this is a successful business model or a lack of confidence in visitor acquisition and how this can damage the industry in the long-term. In keeping with the theme of the EN Question Time session, organisers can apply for a complimentary ticket, all we ask is that a £10 donation is made to Events for Namuwongo. The debate will be chaired by EN editor Jamie Wallis and will be followed by lunch and an afternoon of racing and networking. Panellists include Paul MacDonald who has nearly two decades of experience in the exhibition industry. He spent nearly five years as a portfolio director at Centaur Communications, where he oversaw the marketing and creative portfolio. Under his leadership, he helped grow Marketing Week Live into a market leading B2B event for the UK marketing community. MacDonald was previously an event director at FreshRM, a joint venture business between Reed Exhibitions UK and Montgomery. Panellist Simon Walton will also offer his expertise on the day. A creative director at Silverstream TV, Walton had an extensive career in TV, working for both BBC and ITV. He cut his teeth as a producer and reporter for TV-am. In recent times, he worked as an executive producer for Optomen Television, which made Police, Camera, Action. Also on the panel is Ralph Collett from CloserStill. He has helped launch six shows in the last four years, with more in the pipeline for 2015. Collett previously spent 20 years in publishing and events at Reed Business Information. 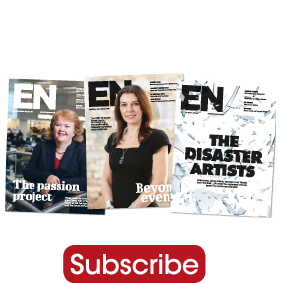 EN editor Jamie Wallis said ahead of the event: ‘As editor of this magazine, I am thoroughly looking forward to the Exhibition News Race Day and chairing this year’s EN Question Time. Tickets for the race day for non-organisers are priced at £199 for a single ticket or £159 for a single ticket for Event Suppliers and Services Association and Association of Event Venue members. In addition, £10 from all tickets purchased will be donated to Events for Namuwongo. For more information, visit www.exhibitionnews.co.uk/raceday, or contact the EN Events Team on 020 8971 8265 or events@mashmedia.net.